It is squash season and soup is the best way to enjoy those cool fall nights. Quarter a whole squash lengthwise, quarter the onion, & drizzle with a bit of olive oil and sprinkle with salt and pepper. Roast at 375 until fork tender. While the squash and onion are roasting, remove chorizo from casing, and crumble into soup pot. Fry until sausage is crispy, and allow to drain on a paper towel. Drain any residual grease from pot, but do not clean. In same soup pot heat up chicken or vegetable stock. When squash and onions are fork tender take them out of the oven and remove skins and put the pulp into the pot. Simmer until quite tender. Using an immersion blender puree until smooth. (Alternatively you could use a blender and blend in small batches, but always remember to leave room for the steam to escape out the lid or it will explode and you and your kitchen will be covered in hot, steamy soup …. NOT a good thing). Return to simmer, and taste – adjust for seasonings with salt, pepper and if you like it spicy, add a bit more chipotle. Garnish with cilantro, green onion and crispy chorizo. Serve as a starter course or a whole meal with fresh hot baking powder biscuits. Use your imagination – all soup recipes are just a starting point. 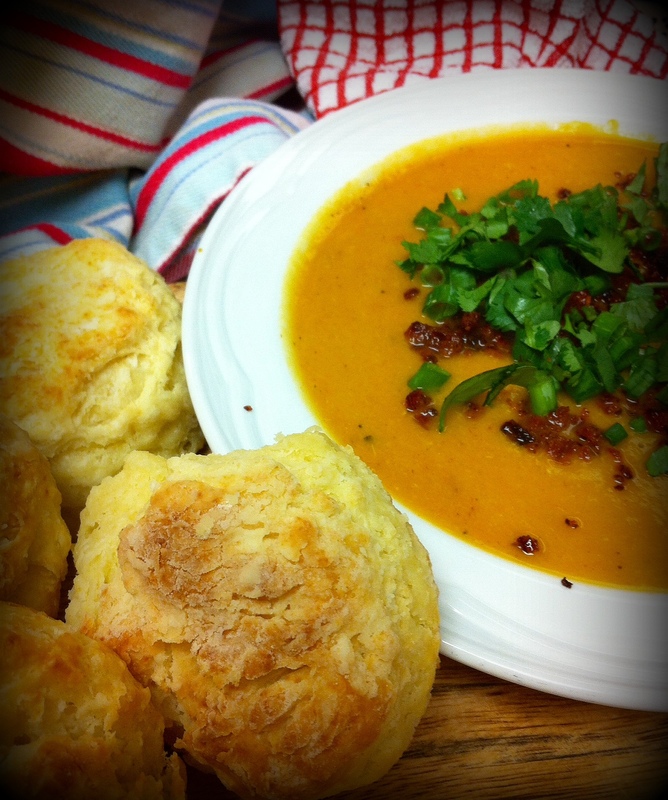 Tonight’s version of this soup included some leftovers …. in this case I had some leftover stewed yellow heirloom tomatoes with squash (yum yum), and a little bit of chipotle chicken leftover, so they went into the pot before using the immersion blender.